When planning a trip to Europe, many people visit famous countries like Germany, Austria, the Netherlands, Italy, France, and Spain. And they leave out Scandinavia. That would be a shame. Ask anyone who has been to these beautiful Nordic countries and they will respond with glowing descriptions. The best time to visit Scandinavia is late spring or early summer, so schedule your arrival toward the end of May. Here's an itinerary that will show you why so many people love Scandinavia. When you arrive in Copenhagen, try to stay in the Hotel Nebo, which is centrally located and just a stone's throw away from Copenhagen Central Station and the Tivoli Gardens. Take a stroll on the famous Strøget shopping street, starting from Copenhagen's City Hall and walking past the Kongens Nytrov until you reach the Nyhavn area. It is a beautiful walk that lets you experience the pulse of the city at a leisurely pace. There are tons of coffee shops, bars, and small shops along this stretch, all of which are worth going to. End your walk at the beautiful Nyhavn waterfront area, which has a magical aura, with open-air restaurants lined on one side and boats docked in the harbor on the other side. This is just the start of what you will experience over the next seven magical days in Scandinavia. On the second day, leave your hotel early in the morning and embark on a long walking tour. The best way to see Copenhagen is to walk and explore it yourself, rather than take the tourist buses. You can make the entire walking loop suggested on the official visitors' map of Copenhagen. Get one of these to the airport from the NSB train ticket office when you arrive, or get one at the tourist center in the city center, opposite the Tivoli Gardens. It is a six-hour walk or more, depending on how many stops you make, and it starts and stops at the Town Hall. The sites you might want to stop and see along the way include Christiansborg Palace, the Royal Library, the Christian’s Church, Christiania, the Danish Resistance Museum, Amalienborg Palace, the Little Mermaid, the Copenhagen Citadel, Rosenberg Castle, and the Round Tower. Walking through the heart of Copenhagen lets you experience every bit of the history, the lifestyle, and the vibrant nature of the city. All through this walk, you’ll come across interesting bars, coffee shops, and restaurants. Take the time to go to some of these places to get an insider's feel of the city. Ankara Restaurant is particularly good for this. The entire walk is really a Copenhagen in a Nutshell tour for people who want to capture the essence of Copenhagen. The next morning, have breakfast and head to the airport for a flight to Oslo. In Oslo, stay in a centrally located hotel such as Hotel Perminalen. Give yourself eight hours to see the city and mark the places you want to see on a map. Freshen up and head first to the Viking Museum via the ferry. Then take a bus from a stop near the museum and head to Vigeland Park to see the hundreds of life-size sculptures by famous Norwegian sculptor Gustav Vigeland. From there, you might like to walk around and experience the best-known places in Oslo. Some of these are the Slottet (Oslo's palace), Stortinget (the supreme legislature of Norway), and Oslo's City Hall. All of these are located along the Karl Johans gate, Oslo's main street, which was named after King Charles III John, who was also King of Sweden. There are many restaurants along Karl Johan street. After spending some time there, perhaps walk to the harbor area, which will be buzzing with busy outdoor restaurants and people strolling around. After spending time in the harbor area, see the Opera House around sunset, which provides a magnificent view of the northern sky that will remain etched in your memory. End the day with a delicious dinner at the excellent Jaipur Indian Restaurant on Karl Johans gate. Experiencing the essence of Norway’s natural beauty begins on Day 4. Check out of Hotel Perminalen in the morning and head to Oslo's Central Station to take the train heading to Myrdal. At Myrdal, change trains for Flam and then take the ferry ride to Gudvangen. From Gudvangen, take a bus to Voss, then the train back to Bergen. You'll reach beautiful Bergen, Norway's second-largest city, in the evening. There is so much to see and do here that you may want to spend more than the one night and a half day we are allotting here. If you arrive in Bergen on May 17, there will be celebrations all over town because May 17 is Norwegian National Day and there are celebrations everywhere in Norway that day. Later that night, we highly recommend taking a cable car ride up Mount Fløyen, where you will see magnificent views of Bergen. You may be tempted to fly to Alesun, which is about 250 miles north of Bergen on Norway's temperate west coast. But a bus trip will reverse that feeling. Right out of your bus window, you will see the most amazingly scenic views, vistas that you can only see in movies. The meandering bus trip cuts through many fjords along the way, with picture-postcard scenery during nearly 10 hours. It may be the most scenic bus journey you will ever have. 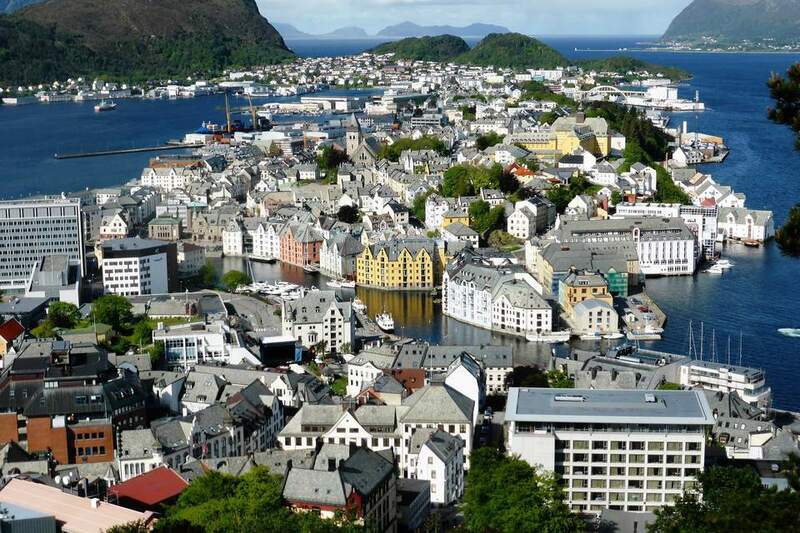 Once in Alesund, make time for a walk in the city to see its renowned art nouveau architecture. If Day 5 was memorable, then Day 6 trip to Geirangerfjord will be spectacular. Take the round-trip bus tour from Alesund to Geiranger via Hellesylt. From Hellesylt, take a ferry ride to the famous Geirangerfjord, which is one of Norway's UNESCO World Heritage sites. The experience is simply exhilarating. Along the sides of the fjords, you'll see farms, many small houses, and a number of waterfalls, including the famous Seven Sisters. At the end of the ferry trip, you'll land in the town of Geiranger. Hike up to the Norway Fjord Museum, which is about 20 minutes by foot. The view of the Geirangerfjord along the hike cannot be described in words. If you’re a true nature buff, this will be the place of your dreams. Try to spend the next couple of hours in the area to soak up the views of the place. Later that evening, take the bus to Alesund. When you reach Alesund, you might want to hike up to Fjellstua in order to get a 360-degree view of the small town. The 15-minute hike up to Fjellstua is splendid, with constantly changing scenery, and absolutely worth the hike. With the three nature-themed days of the trip coming to an end, take a flight early in the morning to Stockholm. Upon arriving in Stockholm, check into your hotel and get ready for a walk around this lovely city. Start at Stockholm's City Hall and take a walk along the Stromgatan through the Nybroplan (or "New Bridge Square") area. Stroll along Strandvagen, absorbing the sights of the city. There are a lot of people strolling around this area along the harbor and just enjoying the pretty harbor views. If you are doing this on a Friday evening, make your way to the Stureplan area, which happens to be one of the better happy-hour spots in Stockholm. You'll also want to walk along the Kungsträdgården and see the many people relaxing in the garden. Later that evening, take a train to the Södermalm district. When you arrive, head for the Skyview to get a great view of the city from above. The Södermalm area has an active nightlife. In the evening, the place is buzzing with activity, thanks to the countless outdoor restaurants. Make sure you go to the bar near Och Himlen Därtill Restaurant for an amazing view of the city. Start Day 8 with a morning of sightseeing, going first to the Vasa Museum. This museum is one of the must-see places in Stockholm. The sheer size of the 17th-century ship there (which was recovered intact) and the amount of information discovered about the people who built the ship is astonishing. You'll want to spend several hours there before going on a boat ride to the Royal Palace, which has lovely museums about Swedish history. Later that evening, head to your final destination: Gamla Stan (Old Town). This area is a romantic area of Stockholm, dominated by narrow alleyways and cobbled streets. Take a stroll along the streets of Old Town and just drink in the architecture and atmosphere. Spend the evening in Gamla Stan, where you'll find great places for lunch or dinner. This entire trip is, for many, like a fairy tale that couldn't have been scripted better. The breathtaking views of the fjords, the scenic journey along Norway’s west coast, and the beautiful cities of Bergen, Alesund, Copenhagen, and Stockholm will fill you with memories that will last a lifetime.